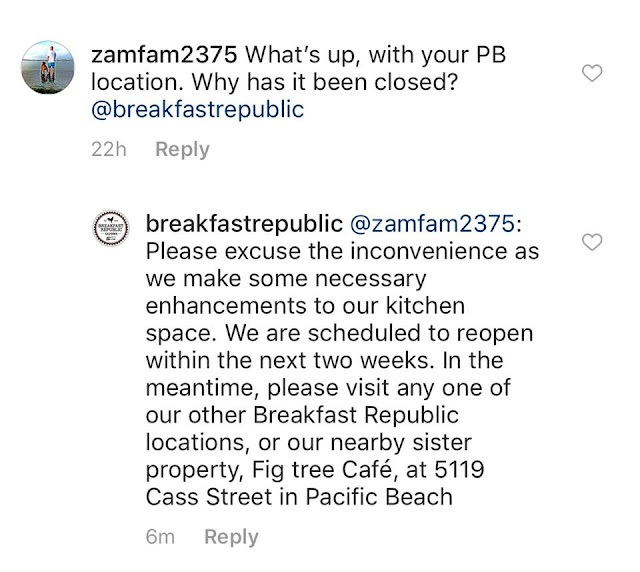 A note on the door referencing electric issues was all the notice that some received about last week's surprise closure of Rise & Shine Restaurant Group's Breakfast Republic location in San Diego's Pacific Beach, which some area residents are speculating could last for up to 6 months. While Rise & Shine Restaurant Group's founder Johan Engman is off canoodling with his fiancee in Southeast Asia, his San Diego breakfast empire has hit a bump in the road. 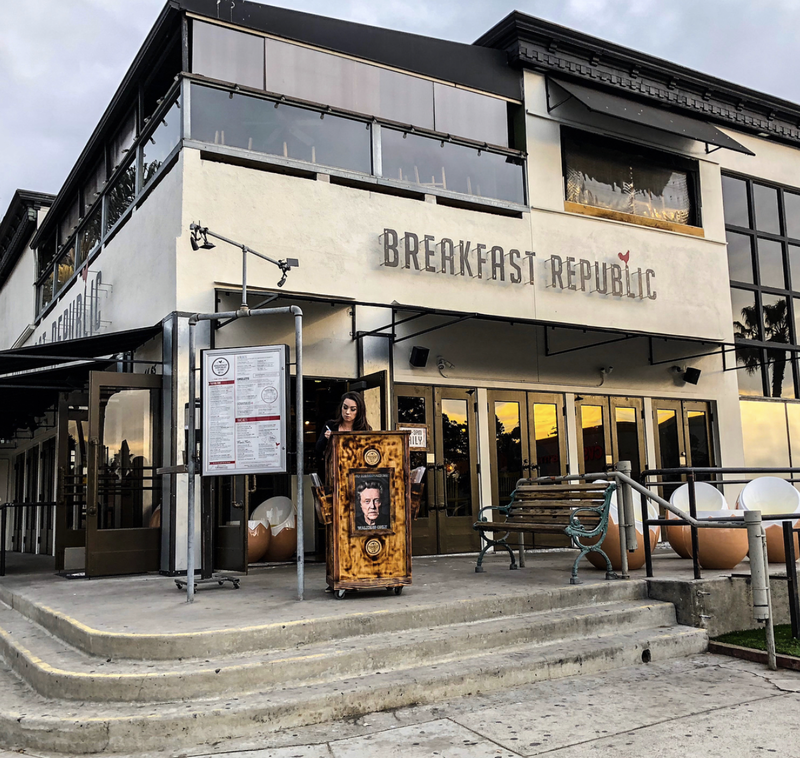 The seventh location of Rise & Shine's Breakfast Republic, which opened at the former Miller's Field space in Pacific Beach last December, abruptly closed at some point over the past week or so. A note on the door indicates that electric issues are to blame, but members of the Social Pacific Beach Facebook Group, including alleged employees, are saying otherwise, claiming that the restaurant may have had kitchen and/or structural code issues. 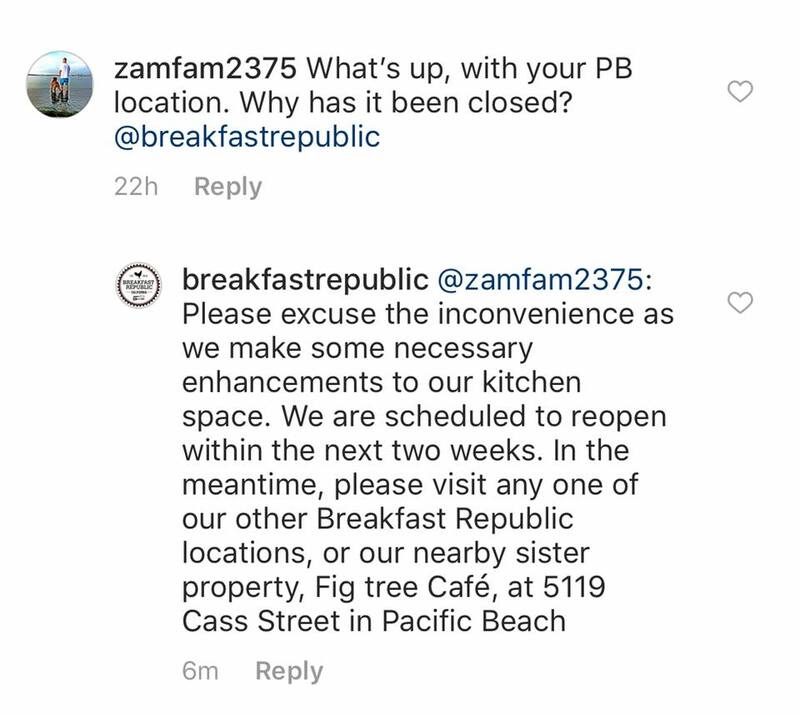 A screenshot posted by one profile has a comment by Breakfast Republic that states that the PB location is undergoing kitchen "enhancements." We reached out to Engman and his known PR for comment but have not received any information about the reason for the abrupt stall. Swedan native Johan Engman's Rise & Shine Restaurant Group began in 2008 with the debut of the flagship Fig Tree Cafe in Pacific Beach. The burgeoning San Diego restaurant collective now operates three Fig Tree locations (PB, Hillcrest & Liberty Station) and packs the house at 7 locations of its Breakfast Republic eateries (North Park, Ocean Beach, East Village, Encinitas, Liberty Station, Carmel Valley, and Pacific Beach). Anticipated to debut in May 2018 will be the 8th Breakfast Republic, opening inside The Shoppes at Carlsbad - the brand’s first venture inside of a retail mall - followed by two more outposts in the works for within the space that currently houses Panda Express across the street from Westfield’s Mission Valley Plaza and the first location outside of San Diego that will debut at 4213 Campus Drive in Irvine, CA. Engman also has North Park Breakfast Company near completion for early 2018, is opening a from-scratch Italian concept previously dubbed Pizza Republic in North Park (now called NorPa Kitchen), is bringing sister Mexican concepts to the space left dormant by the short-lived Crudo French restaurant in The Village at Pacific Highlands Ranch in Del Mar, is launching a fast-casual breakfast stand chain named Eggies, and is building an upscale Mexican restaurant in Liberty Station named El Jardin, whose Executive Chef Claudette Zepeda-Wilkins is currently part on the most recent season of Bravo network's Top Chef culinary competition. For more information on Rise & Shine Restaurant Group, visit riseandshinerg.com.